The Daisy Chain Quilt Along is still going strong. Monday, Alison released the instructions for Unit D. This involved sewing some strips together and sub-cutting them before joining them to other strips. Here are the strip sets that I sewed. 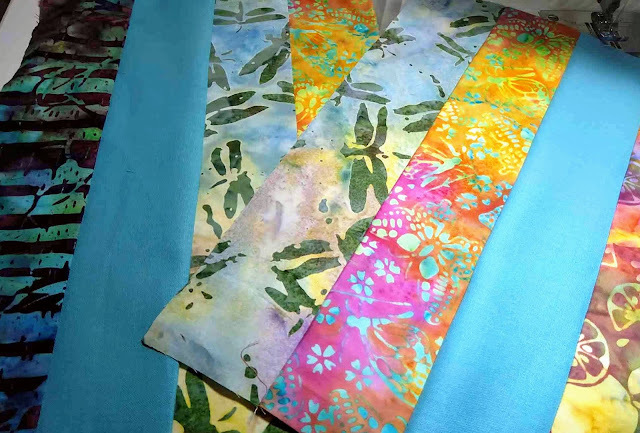 I chose to use three Island Batik fabrics in each set, along with one solid in an aqua color. I did not use the same three batiks in each set, but I aimed for a nice scrappy variety but using the aqua in each set added a bit of consistency. Here are some of the strip units. As you can see I did repeat some of the batiks, but I also mixed it up so that there was a planned randomness. Those strips were cut into two and a half inch sections and sewed to the background strips. Finally those needed to be pressed open to finish unit D.
Since I am making the throw sized quilt, I constructed a total of 24 of these units. 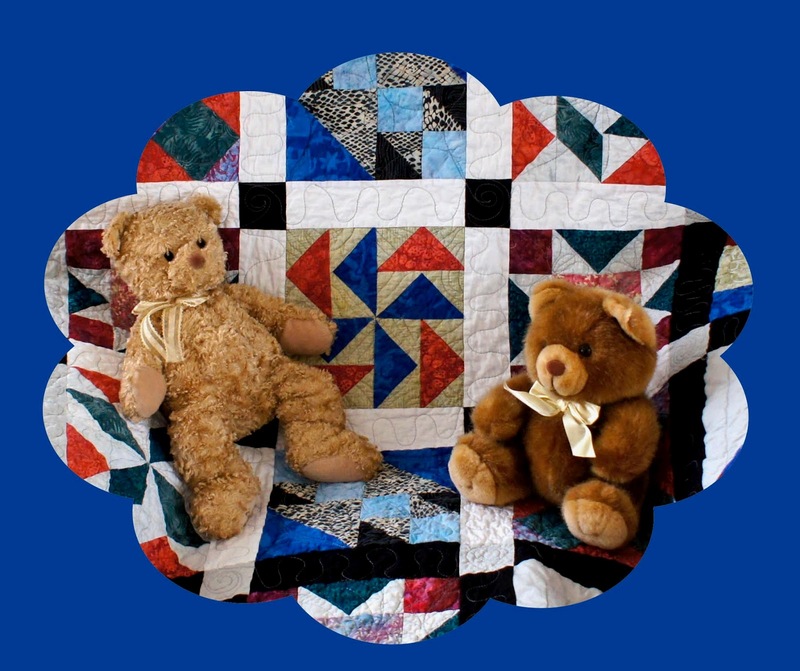 According to the schedule we will begin using the various units to start constructing our quilt tops on May 6th. 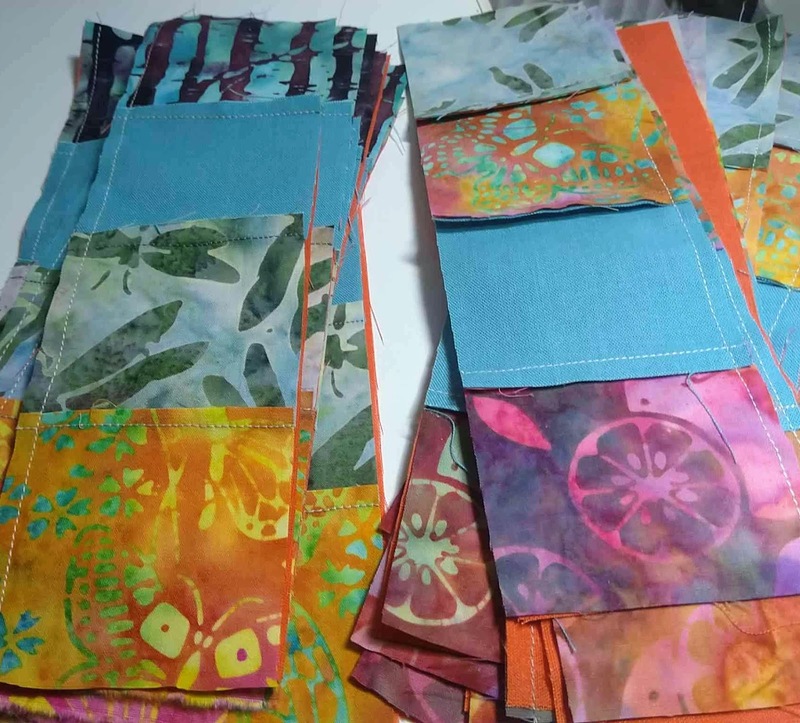 I am really looking forward to seeing exactly how these units will go together to become a quilt. 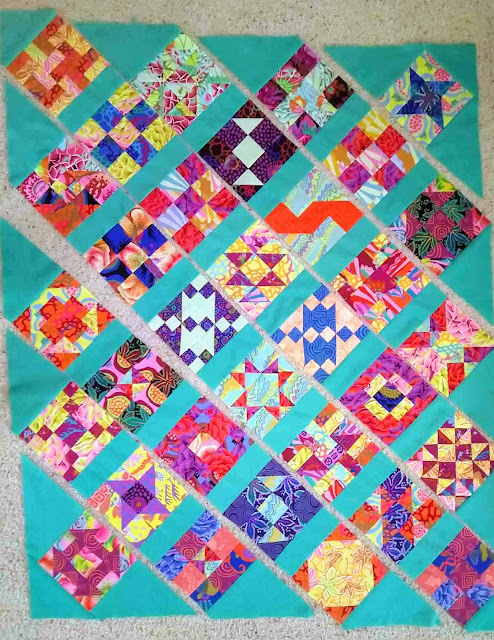 This has been a fun quilt along for me so far. I really think that I will love the finished quilt. 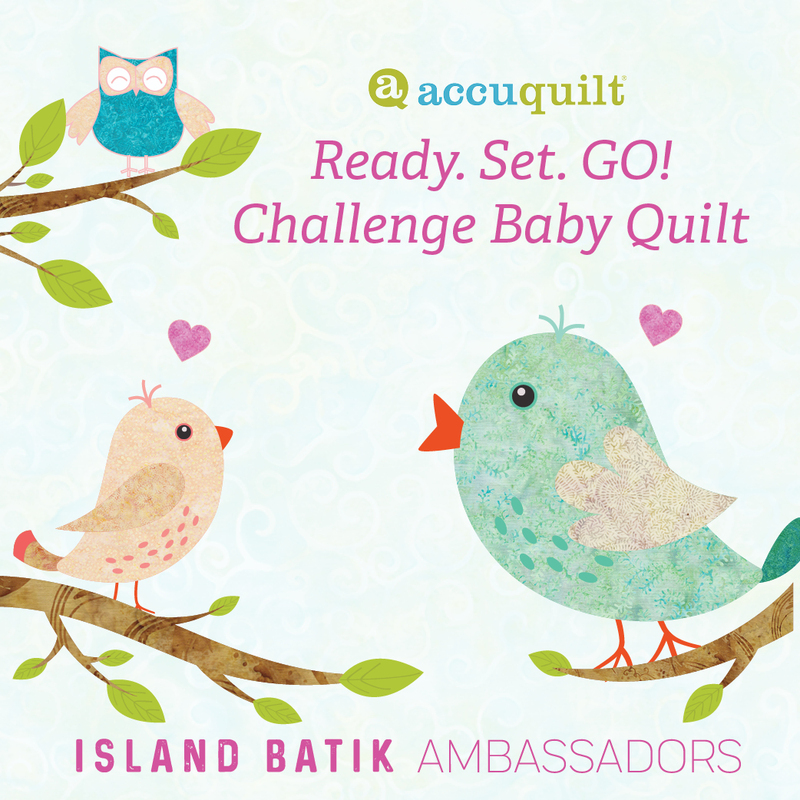 The Island Batik Ambassadors were given an Accuquilt Ready, Set, GO! package this year as part of an industry partnership with Island Batik. For the April Challenge we were asked to make a baby quilt using the Go! cutter and the 8" Qube set that are included with the package. This is the point where I confess that this was actually the first quilt top that I made as an Island Batik Ambassador. I could not resist playing with the dies and experimenting with the blocks in the Eleanor Burns book that came with it. I wanted to try every block in the book, but I managed to limit myself to only enough to make the quilt. Since it is an on-point layout, that came to thirteen blocks. I chose to use black, gray, and white as the setting triangles and sashing. 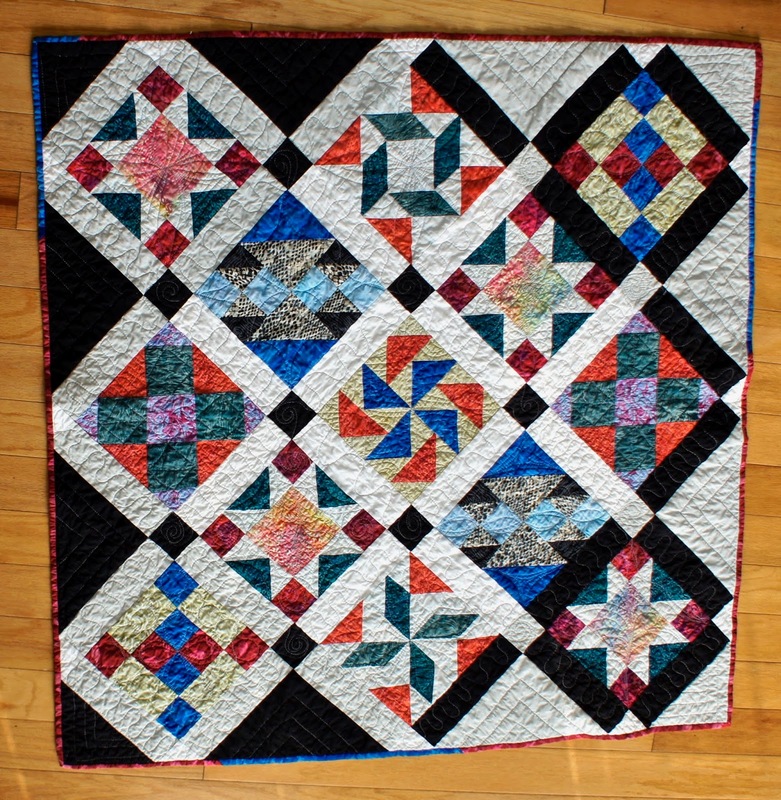 There are four of the "Sawtooth Star" blocks in this quilt. There are two "Old Maid's Puzzle" blocks, two "Frayed Four-Patch" blocks, two "Broken Sash" blocks, one "Whirlpool" block and one variation on it, where I just changed the construction - I am calling it a design choice. And in the very center there is a "Dutchman's Puzzle" block. The Accuquilt package also came with a 2 1/2" strip die. I used that die to cut the sashing strips and cornerstone squares. 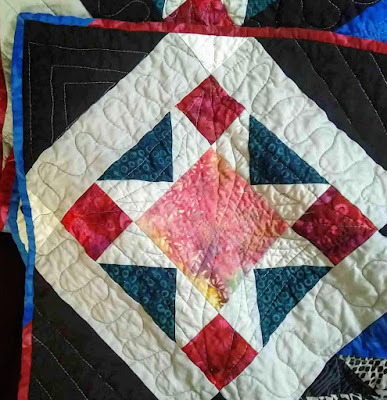 This quilt measures 42 inches square. The batting is Hobbs Premium Cotton batting. 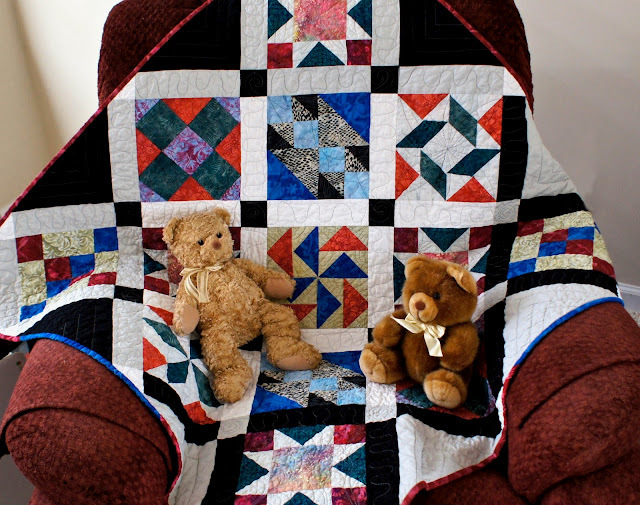 The quilting was done with Aurifil threads in black and gray. I decided to do a casual quilting that is less dense than my usual quilting as I wanted the baby quilt to be soft and snuggly. In these photos the quilt has already been washed to produce the "crinkle" effect that I find so appealing in a quilt that will be used and loved. 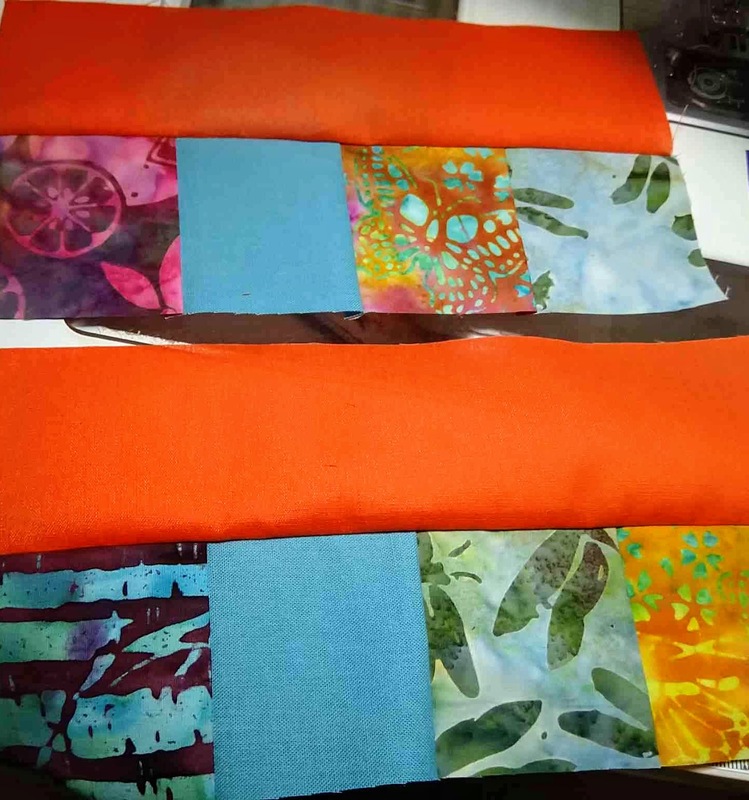 I decided to do a two color binding in blue and red in order to echo some of the colors in the quilt. Here is a cute photo with a couple of teddy bears from Mom's collection. 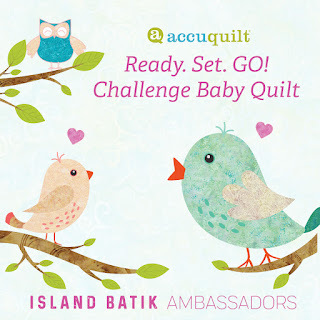 The fabrics were provided to my by Island Batik as an Island Batik Ambassador and the Accuquilt Ready, Set, GO! cutting system was also provided as mentioned above by Accuquilt in partnership with Island Batik. The Hobbs Batting was also provided as a part of the Ambassador program. The Aurifil thread was in my stash although other Aurifil threads were also provided by the Ambassador program. My sincere thanks to Island Batik and all of the partners/sponsors of the program.